Account-based marketing has become incredibly popular over the last decade. The shift in the way that customers shop for B2B solutions has forced organizations to change the way that they interact with those prospects. According to a Survey from SiriusDecisions, 27% of respondents said that they were planning on devoting between 11% and 30% of their total marketing budget to ABM, up from 19% the previous year. Account-based marketing (ABM) places the focus on the organization. In ABM, the prospective company as a whole is considered to be the “prospect,” with a single account including all of the stakeholders and decision-makers that will be involved in the decision-making process. There are a few reasons why the practice has become one of the fastest growing industries, but one of the driving forces has been the availability of software that helps these companies to better track their interaction with target accounts and share information between the various people that will be handling those interactions. Account-based marketing focuses on the alignment of sales and marketing teams to improve the sales process and provide a better experience for both your salespeople and the prospects they speak with. A key piece of the ABM puzzle is having an understanding of the organizations that you will be selling to. An org chart is an absolutely necessary piece of any ABM strategy so that you can gain an understanding of the stakeholders within a target organization, learn more about them, and speak to their biggest concerns as they relate to your product. Account-based marketing was built for B2B sales, where you are selling to organizations where multiple people have to give the “go-ahead” for any deal to go through. There may be multiple departments that are affected by your product who want a say in whether or not it is the one chosen by your business. To sell to organizations with multiple stakeholders, you have to understand who those stakeholders are, what positions they hold, and how the installation of your product might affect them within the company. This is something that all B2B companies need to take into consideration when they are selling a product. Org charts are the perfect solution to this problem. By putting together org charts for each of your key accounts, you give your marketing and sales teams a straightforward way to identify stakeholders and stay up to date on changes within prospective organizations. Once you identify stakeholders, you need to connect those people to personas that you have within your marketing systems. Personas help you to gain a deeper understanding of the different types of stakeholders that make decisions within an organization. Personas typically include demographic information, concerns, quotes, and any information that may be relevant in the selling process. Having an org chart will help you to easily connect those personas to the different stakeholders inside of your key accounts. Using Organimi, you can even create a custom field specifically for persona information relating to each person. Organimi gives you a simple way to create an ABM org chart and use that to better organize information about your prospects. The average B2B sales cycle takes more than 100 days to come to completion. For large, expensive products it can take as long as 9-12 months for a deal to come to completion. The length of B2B sales cycles and the fact that there will be multiple stakeholders within any organization can make it difficult on sales and marketing teams in the long-term. Employees and stakeholders involved in the decision-making process are likely to leave at some point, leaving you with a new stakeholder that you have no previous relationship with. Use Organimi to keep an updated view of all of your key accounts. As stakeholders leave the company, you can update your org chart with just a few clicks and stay up to date with the stakeholders within a given company. The more you know about your prospects, the better you can tailor your message to their specific needs. If you work in account-based marketing, you likely work very closely with your sales teams. Unlike in more traditional sales and marketing strategies, the two are aligned in ABM and work together to facilitate the sale. Your messaging has to be consistent to facilitate true alignment. When you work closely like that toward the same goal, any help that you can provide the sales department is going to win you points. By providing a fleshed out org chart, complete with all of the information and intelligence you have been able to gather, you will find that not only are your salespeople more effective but that they are appreciative of the intelligence that you provide them with. Account-based marketing is all about relationships. You create and facilitate those relationships by understanding the lay of the land within the target companies in your system. An org chart is absolutely necessary for understanding the structure within a company and seeing the roles that all of the stakeholders will play in the decision-making process. You can create an org chart on your own, but can also use help from prospects within your organizations to flesh them out. By portraying the creation of the org chart as a necessary step for managing the sales process, you can learn more about your target companies. Organimi is built to help account-based marketing teams. Our software and easy-to-use drag-and-drop interface make it dead-simple to create, update, and publish an org chart for your entire team to use. Updating the org chart requires just a few clicks, ensuring that you always have the most up to date information about each of the prospects in your system. 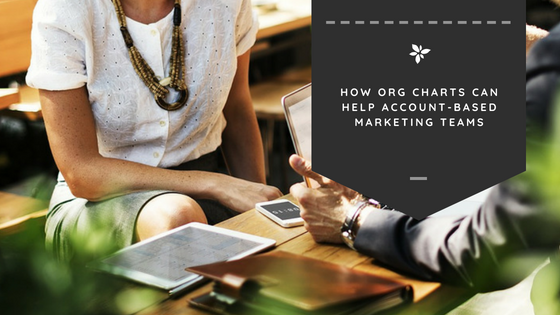 If you would like to see how Organimi can help your account-based marketing team, sign up today for free and create your first org chart. Subscribe to the Organimi blog! Get tips & tricks on how to improve your org chart. What is an Applicant Tracking System and How Can It Help Your Business? © 2019 Organimi Inc. All rights reserved.